Little. Simple. Different. Better. Or at least, 100 people sure think so. … so I’ll make this a two-minute post. Yes, it seems the Monome 64, the cute, new, and improved 8×8 Monome, sold out its short initial run in one hundred twenty seconds and fried the order system. I’m guessing the low price, growing Web buzz, and attractive compact design with wooden edges all contributed. The Monome will be getting another 100 units soon, though, so I think if you’re looking for Monome love, you won’t be disappointed in the long run. That raises an important question, though: with hunger for alternative music-making devices, why was so much new tech at the NAMM show (and elsewhere) so conservative — and, speaking of designs that do look different, can we dare to hope for a worldwide launch of Yamaha’s Tenori-On? 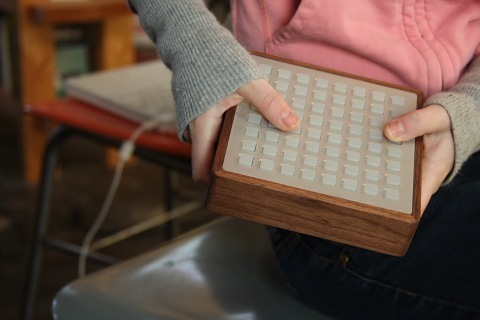 (I promised I wouldn’t compare Tenori-On to Monome again, but let’s put it this way: creative designs sells, and both designs count as creative design.) Things you’ll notice the Monome doesn’t have: giant decals of its logo, or a logo, period, weird acronyms for included technology (OSC! VAST! V.LINK! AWSUM! MUSIQCK! MLFY039! is not tattooed anywhere), there’s no unreadable LED screen, no input for a mouse … I’ll stop. Apologies to the major music manufacturers, but you’ll notice even among the products from the Big 3 (Yamaha, Roland, Korg), it’s often the small and simple devices that people love over the long haul — things that are beloved rather than disposable. Sure, 100 units to those guys is nothing, but I think the point still holds. So, let’s ask you: what’s the favorite music-making gadget you own that you can pick up in one hand? Tuners and metronomes count.